For the finest in gold and silver buckles, try a custom #24202 trophy belt buckle. These immaculate buckles come with multiple-sized gold and silver ball-edge trimming. They feature the rugged, tarnish-free Montana Armor™ finish and include date trim, stones and two ribbons for engraving. The sample on the left features the “Team Ropers” figure #625 with emerald green stones. 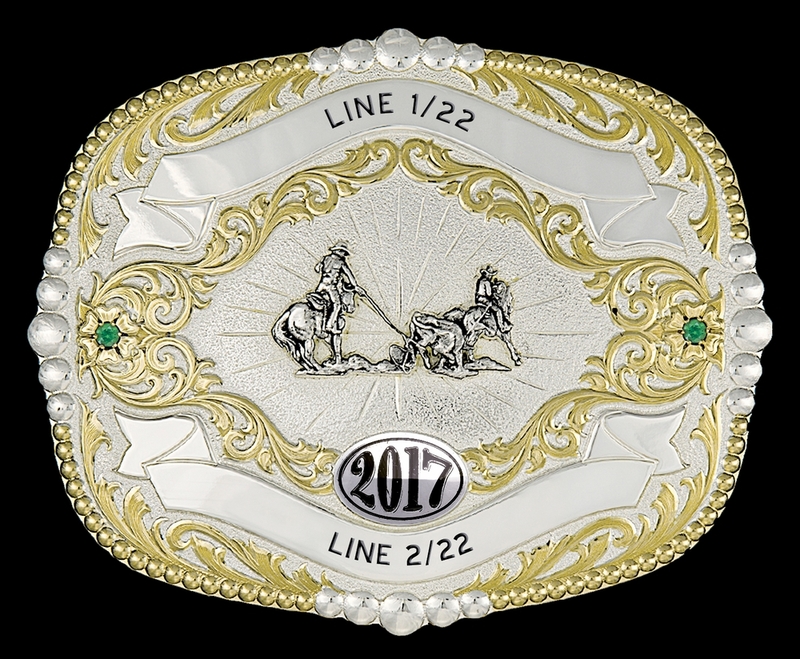 The buckle is available with a variety of gemstone and figure options, including the option to use your own brand or logo. Measuring at 4 5/8" x 3 3/4,” these trophy buckles fit a standard 1 1/2" belt or smaller. Please allow 4 - 6 weeks shipping for your buckle to be delivered.